The United States is a key growing market in Emirates' global network. Emirates commenced non-stop passenger flights between Dubai and New York JFK in June 2004 and since then has expanded to Houston, Los Angeles, San Francisco, Dallas/Fort Worth, Seattle, Washington DC, Boston, Chicago, Orlando, Fort Lauderdale and Newark. In total, we operate 101 passenger flights per week between Dubai and the US – five times daily to New York with three direct flights and one each via Milan and Athens; daily to Boston, Chicago, Dallas/Fort Worth, Houston, Los Angeles, San Francisco, Seattle and Washington, DC, and five weekly flights to Fort Lauderdale and Orlando. With the addition of the Athens-Newark flight in March 2017, Emirates’ US-Europe market share in terms of weekly frequencies and seats remains below one percent. Emirates operates the Boeing 777 to seven of its US destinations. It also operates the Airbus A380, powered by US-made Engine Alliance engines to Houston, Los Angeles, New York JFK, San Francisco and Washington DC. Since 2004, Emirates has carried 21.7 million passengers on its US flights. For the US economy, Emirates delivers high-yield tourists and business travellers from important developing markets in the Middle East, Africa and Asia Pacific. Our flights between the US and Dubai have also carried 960,000 tonnes of high value goods since 2004. This facilitates US foreign trade and opens up new markets for US exporters in the Middle East, Africa and Asia. Every week, we carry items such as auto parts out of New York JFK, seasonal produce such as apples and cherries from Seattle, oil and gas equipment out of Houston, medical supplies out of Los Angeles, and frozen meat from Chicago. In total, our cargo capacity from the US is over 1,850 tonnes per week. Emirates helps to link the US, the world’s largest economy, with emerging markets that will further drive American economic growth, trade and job creation. Of the 87 destinations on our Middle East, Africa and Asia Pacific network, 67 destinations are not directly served by any US carrier. For example, the breadth of our network between the US and India is unparalleled, offering more flights than any other foreign carrier and significantly reduced travel times compared to airlines connecting via European hubs. Read more about Emirates’ operations in our factsheet 'Emirates and the US'(Opens a PDF in a new tab) and 'Creating value for the U.S'(Opens a PDF in a new tab). Emirates has been serving the US since 2004, offering American consumers, communities and exporting companies direct flights to more than 50 cities not directly served by any American carrier. We proudly contribute to the goals of Open Skies which are: greater competition, increased flight frequency, promotion of business travel and tourism, improved service, customer-centric innovation, and consumer choice. US legacy carriers got the facts wrong, got the law wrong, and set their sights on an outcome that will be wrong for American consumers, communities and the national economy. The allegations about Emirates receiving subsidies or competing unfairly are patently false. There is no ‘secret’ to our success – it’s all here in black and white. What the US legacy carriers want is protection from competition, but that outcome would only harm American consumers, communities and the national economy. Emirates’ response systematically disproves each of the US legacy carriers’ allegations. Emirates has published the results of a new economic impact study ‘The Economic Impact of Emirates in the United States’ written by Campbell-Hill. The study shows that in 2015 alone Emirates’ impact in the US is substantial: a total of $21.3 billion* in revenue contributed to the US economy, including the creation of $10.5 billion in GDP and $6.4 billion in labour income, and more than 104,000 jobs*Annual Impact based on 2015 data and operations. supported. To view the press release, executive summary and full report, along with an infographic that highlights the key findings of the study, please click on the links below. Independent analysis by various US airports and regions show that in addition to offering passengers and shippers more competitive and convenient air service options, our flights produce substantial economic and job benefits for the US cities that we serve. 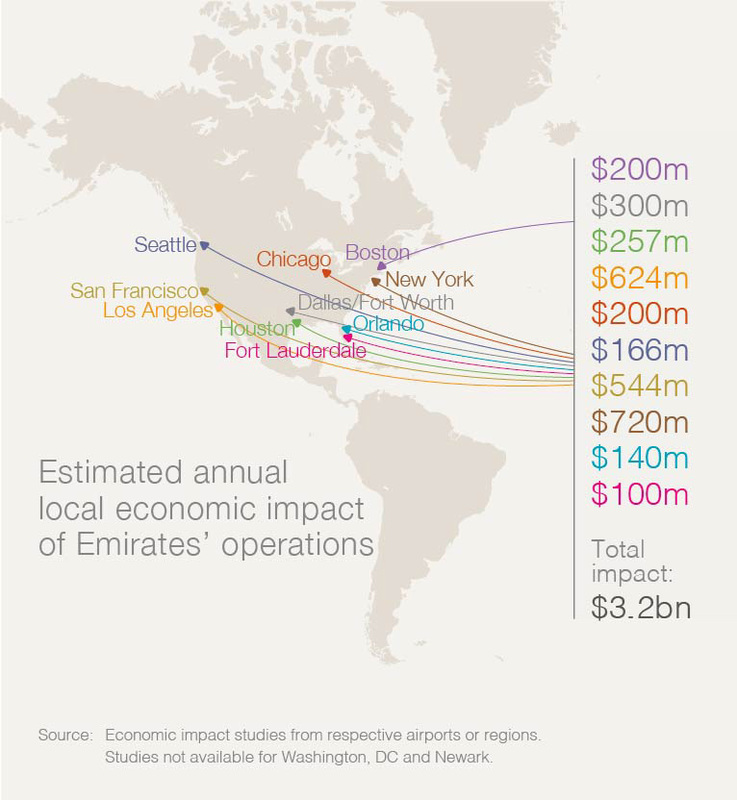 In November 2014, the Port Authority of New York and New Jersey completed an assessment of the economic impact of Emirates' operation in New York. Their assessment estimated that Emirates' triple daily flights to and from JFK in 2013 supported 3,720 jobs in the New York-New Jersey metropolitan region, with US$190 million in wages as well as US$530 million in total regional activity. A study by the Los Angeles Economic Development Corporation found that a long-haul flight such as ours to Los Angeles International Airport generates US$623.5 million in annual benefits to the US economy, sustains 3,120 direct and indirect jobs in Southern California and produces US$156 million in annual wages. Houston Airport System and the University of Houston modelled the impact of the launch of a daily Emirates flight to Houston on the US economy. The results showed the expected benefits would be US$257 million a year as well as 98,000 new passengers a year travelling to or through Houston. The Emirates flight was also predicted to produce US$300 million in economic benefits annually for the Dallas/Fort Worth region in terms of additional visitors, business ties and investments, according to DFW Airport estimates. The Greater Orlando Aviation Authority estimates Emirates’ Orlando service will generate more than US$140 million in annual economic activity and supports over 1,400 jobs, which could increase to US$188 million with an aircraft upgrade. Similarly, the annual economic impact to Broward County as a direct and indirect result of Emirates’ Fort Lauderdale service is estimated to be more than US$100 million and create approximately 1,000 new jobs. The estimated total annual local economic value to 10 of the 12 airports and surrounding regions Emirates flies to in the US reaches US$3.2 billion. In the US our partnerships bring about combined benefits for passengers, US partner carriers and US communities. Emirates signed partnership agreements with JetBlue Airways in 2012 and Alaska Airlines in 2015, feeding hundreds of passengers daily onto their domestic networks. In 2017, Emirates provided over 359,000 feed passengers onto its US partner airlines. The US and the UAE enjoy strong commercial and political ties. In 2017, US exports to the UAE reached US$20 billion, posting a 390% growth since Emirates launched US services in 2004. A significant portion of those exports to the UAE came in the form of Boeing aircraft for Emirates. The UAE remains the top US export destination in the entire Middle East North Africa (MENA) region for nine years in a row according to the US Census Bureau's Foreign Trade Division. In total, the UAE is ranked the 19th largest export destination for American goods, and its US$15.7 billion trade surplus with the UAE was the United States’ third largest globally. At the Dubai Air Show in November 2013, Emirates purchased 150 Boeing 777X aircraft worth US$76 billion at list prices including 300 units of GE9X engines to be delivered from 2020 onwards, writing another chapter in Emirates’ long history with the Boeing 777 family. This was the single largest order by value in the history of US commercial aviation, and also GE Aviation’s largest ever commercial jet engine contract from an airline. In November 2015, Emirates signed a US$16 billion contract with GE Aviation for the maintenance, repair and overhaul (MRO) of the GE9X engines that will power the 150 Boeing 777X aircraft over a period of 12 years. This is Emirates’ largest engine MRO contract to date. At the 2017 Dubai Airshow, Emirates placed a US$15.1 billion order for 40 Boeing 787 Dreamliners. To ensure we maintain a young and efficient fleet, some of these will replace older aircraft while others will be used for future network growth. The Boeing 777 is the backbone of the Emirates fleet. In total Emirates has 165 B777s in service, the most of any airline, which are powered largely by GE Aviation’s GE90 engines. With over 160 additional 777s on order, Emirates receives an average of one 777 aircraft every one to two months. We offer unique connectivity to the US and an independent, competitive alternative to the three large traditional airline alliances. Our success is demonstrated through measured, demand-driven growth in the US – from operating a single daily New York flight in June 2004, to 101 weekly frequencies to 12 US airports today.